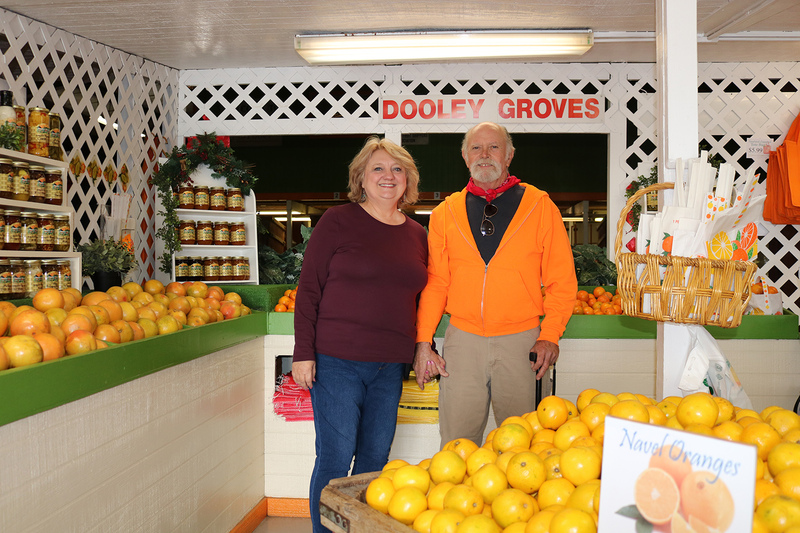 Dooley Groves owners Diane and Mike Houghtaling in the market and gift shop nestled in among the groves of fruit in Sun City, just south of Ruskin off the Tamiami Trail. “An orange by any other name would smell as sweet.” Shakespeare, in Romeo and Juliet, used the word rose instead of orange, but you get the drift. At Dooley Groves, part of the allure is the sweet aroma wafting from the vast varieties of citrus hanging in the groves — and in the bins inside — at this longtime establishment just south of Ruskin between the Tamiami Trail and the Little Manatee River. Dooley Groves’ gift store even has, among its unique selections, small vials of orange blossom perfume if you want to take a tad of nature’s olfactory delights back home with you after your visit is over. To add a little more fragrant pleasure, you can also experience the salubrious whiff of the large eucalyptus trees, which were planted some years ago between several of the citrus groves. The tall thick-leaf trees were planted not so much for the delightful odor but for functional protection as a shield from strong winds and hurricanes and as a barrier to insects and bugs. The succulent smells are just part of the sensory impact at Dooley Groves and Country Farm Market. Add in the green of the countryside and trees, mixed with the yellows, green and orange of the fruit, and you have a visual impact which will light up the dullest brain. The sounds and noises, or lack of, are also worth the price of admission — which is nothing — as you enter this oasis of tranquility, not that far from the beaten path of highways, commercial clutter and traffic, but far enough to provide serenity and calmness in a world of its own. If all you want to hear is the sound of citrus growing on a tree, then Dooley Groves is tailor-made for you. Then to top off the sensory experience, you have the piéce de résistance: The mouth-watering taste of the many varieties of fruit —all unique and all an awakening for the palate once peeled and popped into your mouth. The orange is king, with an almost endless supply of types and tastes, along with grapefruit, lemons and other exotic citrus you have probably never heard of or seen. 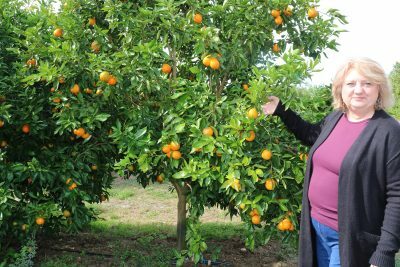 Honeybell and Sugar Belle oranges are yours for the picking at Dooley Groves where Diane Houghtaling shows off part of this year’s bumper crop. Dooley Groves traces its beginning back about 50 years ago when it was started by Mrs. Edith Houghtaling and her husband Julius F. Houghtaling. Where does the name Dooley came in? Because some of the Houghtaling young’uns could not pronounce Julius’ name. Coming out of a toddler’s mouth, the word Julius sounded like the word Dooley. Thus, by innocent, cute baby talk, the enchanted grove was christened with a moniker that has provided a positive branding throughout the years: Dooley Groves. The Houghtaling clan had emigrated from the Netherlands to the New York City area of New Amsterdam way back in the 17th century. From there, the family migrated to the Midwest, settling in Michigan. One more big move to sparsely settled Florida after the Civil War where the Houghtaling family found fertile soil and a warm, year-round climate, and the rest, as they say, is history. Dooley Groves, Inc. is a third generation, family-owned citrus agri-tourist business, located in southern Hillsborough County, in the town of (old) Sun City — some folks call it Ruskin — at 1651 Stephens Road. The Houghtaling family has been growing and shipping fresh, premium citrus fruit varieties for 51 seasons. The Houghtaling family has lived on the farm for five generations, since the late 1800s and the sixth and seventh generations currently live locally, in Ruskin and Riverview. U-pick at Dooley Groves is a family affair. Riverview youngsters Ellie McNabb, in red, and Kinsley Seldat fill up their baskets as parents and friends look on. Mike and Diane met in their junior year at East Bay High, some 47 years ago and have lived on the farm and worked together ever since. Diane says, “We learned to grow citrus from Mike’s grandparents, Julius (Dooley) and Edith Houghtaling, who started the business in the carport of their home in 1967, as a u-pick grove next to the current packing house and gift store. Julius and Edith’s oldest son, Julius (aka Dooley) and his wife Lillie worked the business and taught Mike and Diane the business side of the operation, while granddad Julius taught them the citrus growing. 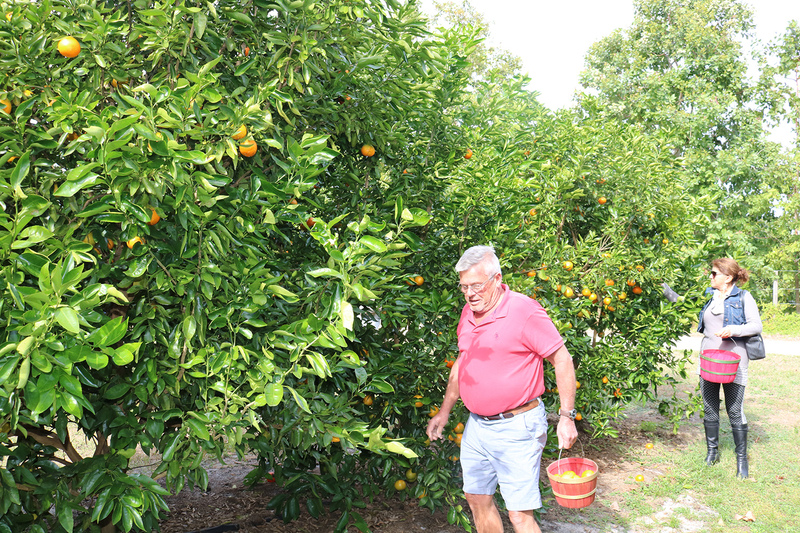 Dooley Groves grows the Florida citrus varieties that are extremely rare and hard to find. Dooley Groves not only grows citrus and oranges now but is a Florida gift-fruit shipper, offering fresh-picked bagged citrus for home or travel. Dooley Groves is the largest u-pick Honeybell grove in Florida. Actually the largest in the world, since Honeybells are only grown in Florida and similar fruit from other states or countries are not Honeybells. The name is derived from the orange of this variety being shaped like a bell and honey because it is as sweet as honey. People come from all over Florida and the United States, Canada and Europe to Dooley Groves just to pick their own Honeybells right off the tree. 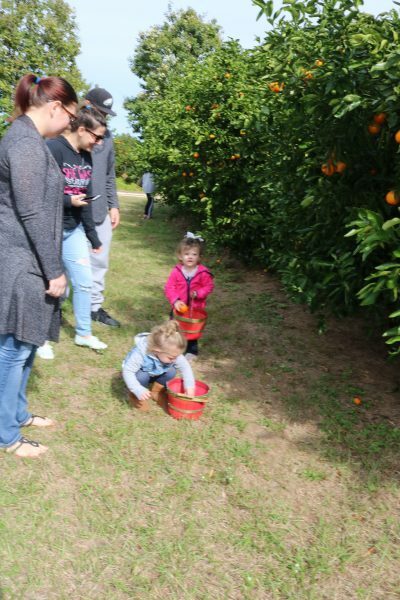 Honeybells are the rarest, most sought-after citrus fruit, and Dooley Groves has over 6,500 Honeybell trees to pick, starting right after Christmas all the way into springtime. They come from near and far to pick ’em fresh from the trees at Dooley Groves, which are an orderly, neat, clean and well-organized compound for growing, cultivating, harvesting, handling, packing, selling and tasting a cornucopia of citrus. Visitors browse the Country Farm Market’s fruit bins, featuring an unusual and tasty array of gifts. Dooley Groves also grows and offers for u-picking Sugar Belle oranges after Thanksgiving through December and Tango seedless tangerines in February and March along with Ortaniques during orange blossom time in March. Grove Guides take visitors through the grove to find the very best area to pick. It’s especially wonderful at orange blossom time with the lovely fragrance. Picking is easy, and it’s fresh-picked fun at Dooley Groves. Dooley Groves grows gigantic pink Pomelos and Ponderosa lemons. These are citrus varieties you just can’t find in most places. During the season, November through April, Dooley ships fruit North to most states in the U.S. and Canada. The menu includes Navel oranges, Fall tangerines, Orlando Tangelos and red seedless grapefruit through Christmas. January is Honeybell shipping time, followed by Temple, Ortanique and Valencia oranges in the spring. Dooley Groves is a place you can take the family when they’re visiting Florida to show them a true old-fashioned Florida attraction. Dooley is open seasonally from mid-November through the end of April, Monday through Saturday from 9 a.m. to 5 p.m., Sundays 10 a.m. to 5 p.m. U-pick is open every day from 10 a.m. to 4 p.m., rain or shine. The groves and store are closed only on Thanksgiving, Christmas and Easter. Call 813-645-3256, or visit www.dooleygroves.com for more information or to order fruit to ship. Diane and Mike live an orange toss from the gift store and on the edge of the groves, making it a perforce 24/7 job. Life as a citrus grower is not a bowl full of cherries, or orange slices. The Houghtalings face a number of challenges, some anticipated and some unanticipated, everyday: A temperamental Mother Nature, fruit diseases brought in from other countries, and government regulations, red tape and interference.